Parallel processing is a mode of operation where the task is executed simultaneously in multiple processors in the same computer. It is meant to reduce the overall processing time. 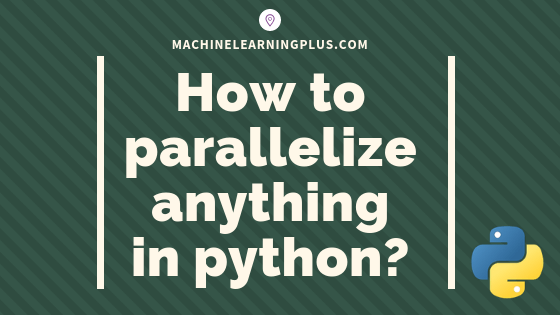 In this tutorial, you’ll understand the procedure to parallelize any typical logic using python’s multiprocessing module. 2. How many maximum parallel processes can you run? 3. What is Synchronous and Asynchronous execution? 5. How to parallelize any function? 7. How to Parallelize a Pandas DataFrame? Parallel processing is a mode of operation where the task is executed simultaneously in multiple processors in the same computer. It is meant to reduce the overall processing time. However, there is usually a bit of overhead when communicating between processes which can actually increase the overall time taken for small tasks instead of decreasing it. In python, the multiprocessing module is used to run independent parallel processes by using subprocesses (instead of threads). It allows you to leverage multiple processors on a machine (both Windows and Unix), which means, the processes can be run in completely separate memory locations. How to structure the code and understand the syntax to enable parallel processing using multiprocessing? How to implement synchronous and asynchronous parallel processing? How to parallelize a Pandas DataFrame? Solve 3 different usecases with the multiprocessing.Pool() interface. The maximum number of processes you can run at a time is limited by the number of processors in your computer. If you don’t know how many processors are present in the machine, the cpu_count() function in multiprocessing will show it. In parallel processing, there are two types of execution: Synchronous and Asynchronous. A synchronous execution is one the processes are completed in the same order in which it was started. This is achieved by locking the main program until the respective processes are finished. Asynchronous, on the other hand, doesn’t involve locking. As a result, the order of results can get mixed up but usually gets done quicker. There are 2 main objects in multiprocessing to implement parallel execution of a function: The Pool Class and the Process Class. Let’s take up a typical problem and implement parallelization using the above techniques. In this tutorial, we stick to the Pool class, because it is most convenient to use and serves most common practical applications. The first problem is: Given a 2D matrix (or list of lists), count how many numbers are present between a given range in each row. We will work on the list prepared below. Let’s see how long it takes to compute it without parallelization. For this, we iterate the function howmany_within_range() (written below) to check how many numbers lie within range and returns the count. The general way to parallelize any operation is to take a particular function that should be run multiple times and make it run parallelly in different processors. To do this, you initialize a Pool with n number of processors and pass the function you want to parallelize to one of Pools parallization methods. multiprocessing.Pool() provides the apply(), map() and starmap() methods to make any function run in parallel. Nice! So what’s the difference between apply() and map()? Both apply and map take the function to be parallelized as the main argument. But the difference is, apply() takes an args argument that accepts the parameters passed to the ‘function-to-be-parallelized’ as an argument, whereas, map can take only one iterable as an argument. So, map() is really more suitable for simpler iterable operations but does the job faster. We will get to starmap() once we see how to parallelize howmany_within_range() function with apply() and map(). Let’s parallelize the howmany_within_range() function using multiprocessing.Pool(). Pool.map() accepts only one iterable as argument. So as a workaround, I modify the howmany_within_range function by setting a default to the minimum and maximum parameters to create a new howmany_within_range_rowonly() function so it accetps only an iterable list of rows as input. I know this is not a nice usecase of map(), but it clearly shows how it differs from apply(). In previous example, we have to redefine howmany_within_range function to make couple of parameters to take default values. Using starmap(), you can avoid doing this. How you ask? Like Pool.map(), Pool.starmap() also accepts only one iterable as argument, but in starmap(), each element in that iterable is also a iterable. You can to provide the arguments to the ‘function-to-be-parallelized’ in the same order in this inner iterable element, will in turn be unpacked during execution. So effectively, Pool.starmap() is like a version of Pool.map() that accepts arguments. The asynchronous equivalents apply_async(), map_async() and starmap_async() lets you do execute the processes in parallel asynchronously, that is the next process can start as soon as previous one gets over without regard for the starting order. As a result, there is no guarantee that the result will be in the same order as the input. apply_async() is very similar to apply() except that you need to provide a callback function that tells how the computed results should be stored. However, a caveat with apply_async() is, the order of numbers in the result gets jumbled up indicating the processes did not complete in the order it was started. A workaround for this is, we redefine a new howmany_within_range2() to accept and return the iteration number (i) as well and then sort the final results. It is possible to use apply_async() without providing a callback function. Only that, if you don’t provide a callback, then you get a list of pool.ApplyResult objects which contains the computed output values from each process. From this, you need to use the pool.ApplyResult.get() method to retrieve the desired final result. You saw how apply_async() works. Can you imagine and write up an equivalent version for starmap_async and map_async? The implementation is below anyways. So far you’ve seen how to parallelize a function by making it work on lists. But when working in data analysis or machine learning projects, you might want to parallelize Pandas Dataframes, which are the most commonly used objects (besides numpy arrays) to store tabular data. The first 2 can be done using multiprocessing module itself. But for the last one, that is parallelizing on an entire dataframe, we will use the pathos package that uses dill for serialization internally. First, lets create a sample dataframe and see how to do row-wise and column-wise paralleization. Something like using pd.apply() on a user defined function but in parallel. We have a dataframe. Let’s apply the hypotenuse function on each row, but running 4 processes at a time. To do this, we exploit the df.itertuples(name=False). By setting name=False, you are passing each row of the dataframe as a simple tuple to the hypotenuse function. That was an example of row-wise parallelization. Let’s also do a column-wise parallelization. For this, I use df.iteritems() to pass an entire column as a series to the sum_of_squares function. Now comes the third part – Parallelizing a function that accepts a Pandas Dataframe, NumPy Array, etc. Pathos follows the multiprocessing style of: Pool > Map > Close > Join > Clear. Check out the pathos docs for more info. Thanks to notsoprocoder for this contribution based on pathos. If you are familiar with pandas dataframes but want to get hands-on and master it, check out these pandas exercises. Problem 1: Use Pool.apply() to get the row wise common items in list_a and list_b. Problem 2: Use Pool.map() to run the following python scripts in parallel. Problem 3: Normalize each row of 2d array (list) to vary between 0 and 1. Hope you were able to solve the above exercises, congratulations if you did! In this post, we saw the overall procedure and various ways to implement parallel processing using the multiprocessing module. The procedure described above is pretty much the same even if you work on larger machines with many more number of processors, where you may reap the real speed benefits of parallel processing. Happy coding and I’ll see you in the next one!